Placebo Democracies covering up for the rule of money, reaches its paroxysm in America, where since its inception company-mothers owned the land and its lawyers and wealthiest rule. In the first age Plantation owners who provided cotton and bought slaves to those companies were its presidents; then railroads lobbyists (Lincon) took over after the ‘entropy=war’ age of the gunboat era. 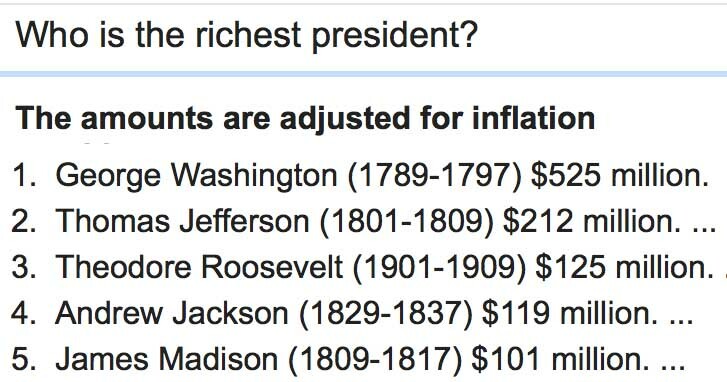 In the graph, the first presidents of America were its wealthiest; followed by its most ‘admired’ (Roosevelts, Kennedy, Mr. Trumpuppet).